Mud agitators are high-efficiency mud mixing units offered in a wide array of custom sizes and configuration to accommodate virtually any mud tank. 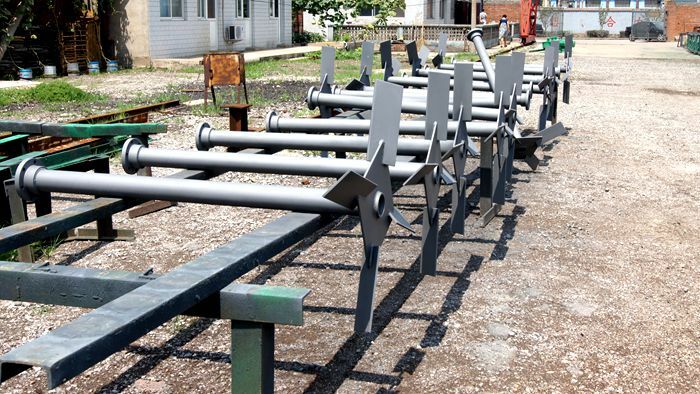 Both horizontal and vertical drive configurations are available for all sizes of mud agitators. The horizontal drive is designed for installations having limited space above the mud tank. The vertical drive agitator employs an all helical gearing system, and the horizontal drive utilizes a helical bevel system to drive the agitator shaft, which may have one or two straight or canted mixing impellers. 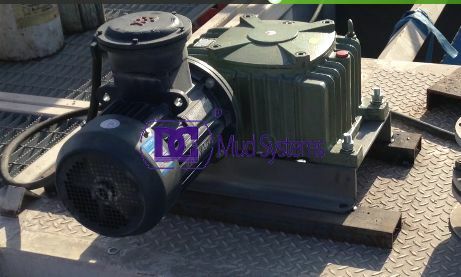 The mud agitator stirs a mud slurry to maintain suspension of solids. The agitator is mounted on top of the mud tank and has one or two impellers immersed in the mud slurry. The impeller shaft directly coupled to an electric drive motor that is available in several horsepower ratings from 50He to 60Hz. Each mud agitator is designed for the specific application, taking into account parameters such as tank size, tank depth, and mud charateristics. 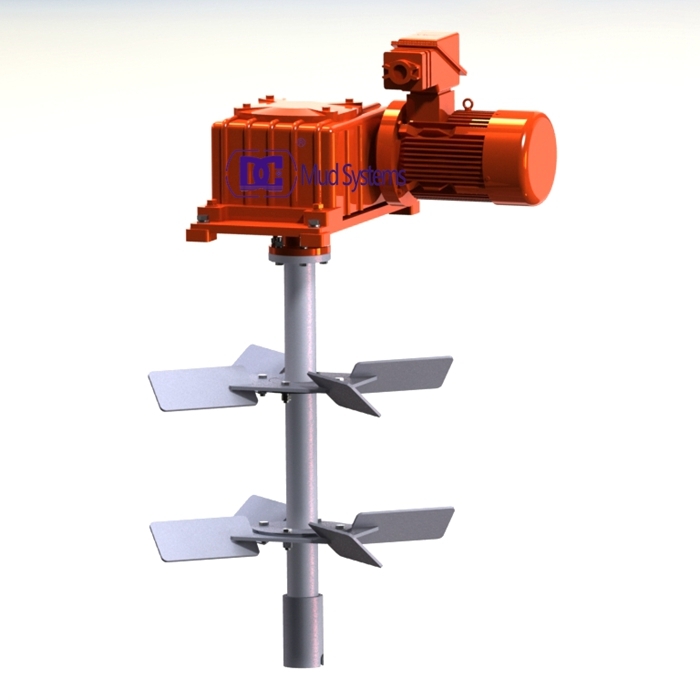 DC Solid control offers mud agitator in both vertical and horizontal drive motor configurations. Our high performance equipment is appreciated among clients all over India. 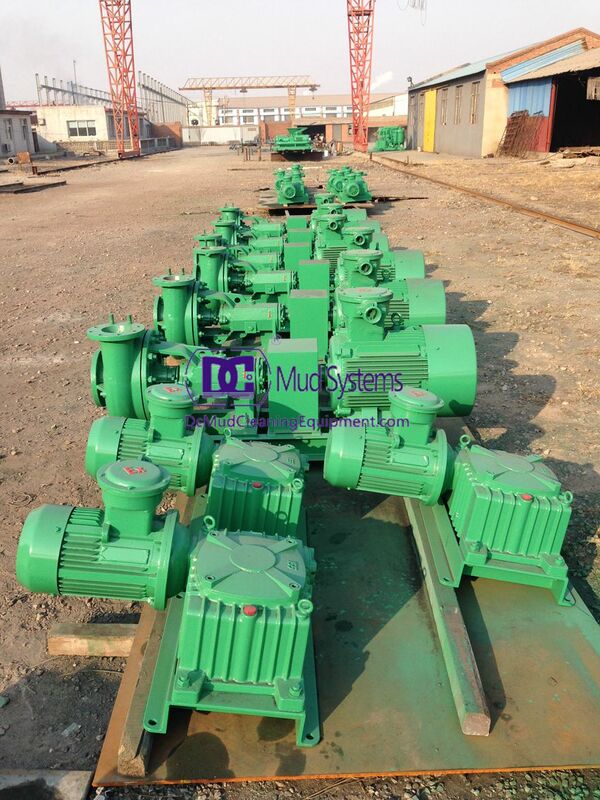 If there is a large quantity of mud present in the site then large torque mud agitator will be required. 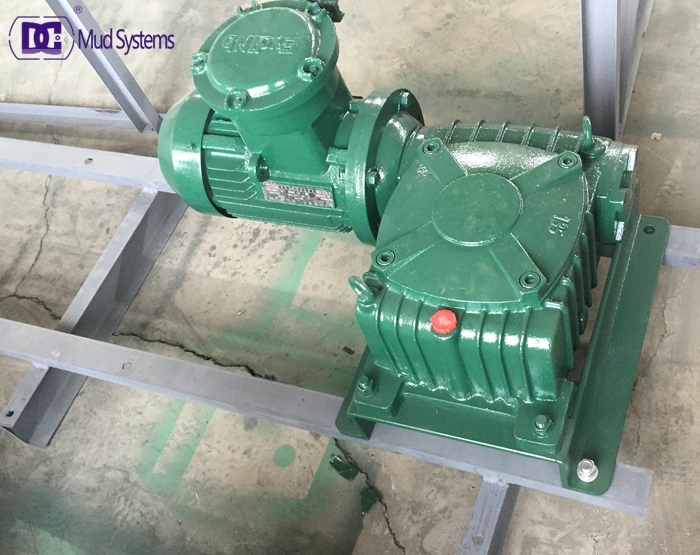 JBQ series mud Agitator, Less than 5.5 kW drilling mud Agitator adopts the blender cycloid speed reducer, and it is applied to the drug liquids mixing tank. This mud agitator has the advantage of compact structure so it occupies small area. 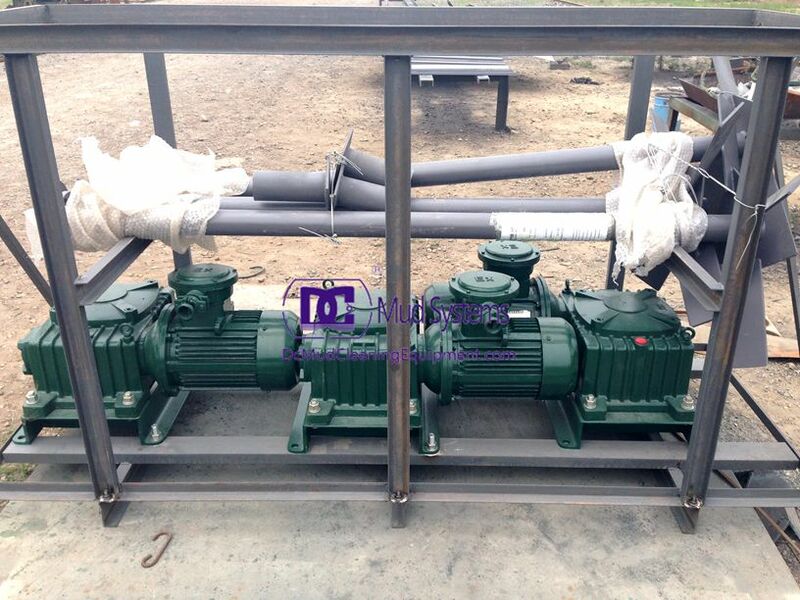 Drilling fluids mud agitator is a kind of mechanical agitator, also part of the drilling fluid solids control equipment, which is mainly used to agitate and mix the drilling mud to prevent solids particles from depositing in the circulating mud tank and to stabilize the performance of drilling fluid. In order to keep the drilling fluids even and make particles suspending, we need to fix the agitators on recycling tank. Agitating will promote the coordination of drilling mud material, such as bentonite and barite. We should keep agitator working continuously to avoid solid precipitating and keep solid suspending is helpful to separate them by Desander, Desilter, and dcanter centrifuge, etc. The agitator is mounted on top of the mud tank and has one or two impellers immersed in the mud slurry. The impeller shaft is directly coupled to an electric drive motor that is available in many different horsepower ratings from 3hp (50Hz only) to 30hp (60Hz). Each agitator is designed for the specific application, taking into account parameters such as tank size, tank depth and mud characteristics. For vertical configurations the drive motor rotates the impeller shaft through an all helical gear drive. For horizontal designs the motor is connected through a combination of helical and bevel gears. Both designs permit mounting of one or two impellers having either straight or canted blades. The purpose of a surface mud system is to allow maintenance of the mud before it is pumped down the hole. This is accomplished by the effective use of solids-control equipment to remove undesirable solids, while simultaneously recovering as much drilling fluid as is feasible. Secondary to the solids-removal process is the addition of chemicals and the rapid and thorough mixing of mud materials. Thorough agitation is necessary to effectively accomplish both of these tasks. In the majority of drilling fluids, agitation equipment must be used to suspend solids in the surface tanks and maintain a homogeneous drilling fluid.
. fluid motive devices, also called mud guns. Both are widely used, and will be discussed by showing basic principles, installations, and sizing guidelines. Drilling-fluid components such as bentonite (gel), barium sulfate (barite), lost circulation material, polymers, and chlorides (to name a few) must be wetted before they are dispersed throughout the system. Proper introduction of these materials into the drilling fluid is equally important and can enhance drilling efficiency as well as reduce the amount of additives needed. To gain the most advantage, correct addition at the surface will enhance their effectiveness in the well. Several technologies are described to blend, add, hydrate, shear, or mix drillingfluid additives and enhance their effectiveness. As stated previously, the purpose of agitation equipment is to suspend solids, completely mix mud materials, and maintain a homogeneous mixture throughout the surface system. For all of these requirements to be met, agitation equipment must create an upward velocity within the mud tanks that is greater than the settling velocity (see chapters 8, 11, and 13 for a complete explanation) of the suspended solids. There must be adequate shear and stirring to dissolve, wet, and disperse mud additives. The ability to blend drilling fluid helps maintain consistency. The following discussion illustrates how mechanical agitators and mud guns operate and accomplish these goals. The beginning of the eighties of China, part of the mud agitators used in solids control system are imported from foreign companies. In the late eighties, began to make copies of the imported agitators, the main problem of this period are: poor reliability, bad mixing effect, large power consumption, the impeller blades are easy to break, can’t work in long-term and continuously, serious oil leakage, oil leakage is almost a common problem for this kind of agitator. Its impeller forms are mostly single impeller and disk type impeller, liquid in the tank can’t form a good convection, solid particle suspension is not sufficient. After the past few years’ effort, mud agitators made in China have developed from imitating and mapping to creat new structures independently. Long term problems have been solved in some new structure mud agitators. The drilling mud agitator is mainly used for mixing the drilling fluid to keep the uniformity of the mud and the suspension state of the solid particles. It can agitate the drilling fluid consecutively and reliably with both axial and radial flows to ensure the active mud system flowing evenly without participation of the silt, sand and other solid matters. 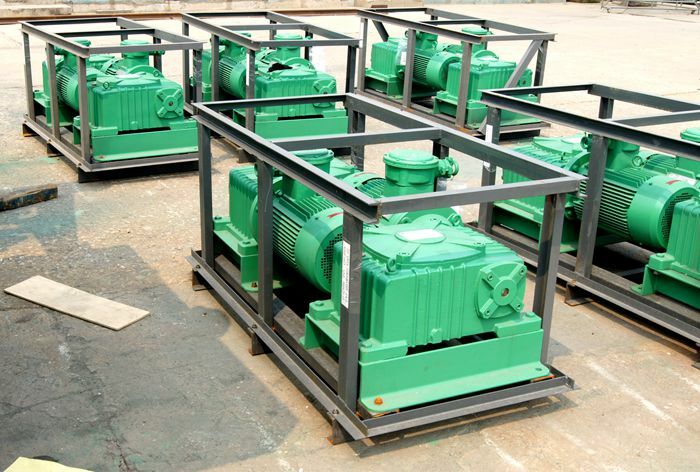 DC Machinery produces the product of four kinds with the motor power of 5.5kW, 7.5kW, 11kW and 15kW respectively. The product with the power less than 5.5kW adopts cycloid speed reducer. 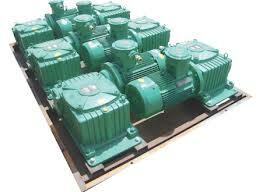 The product with the power greater than 7.5kW uses turbo and worm gear speed reducer. It has the features of large transmission torque, steady operation and working reliably. The drilling mud agitator adopts explosion proof C-face electric motor which is approved by ATEX and IEC Ex. If customers have the needs, it can be furnished with marine motor. 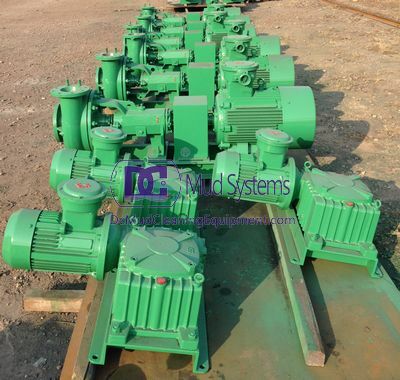 Different from the centrifugal pump and drilling mud gun, the product is designed with relatively low shearing capacity and low energy consumption. 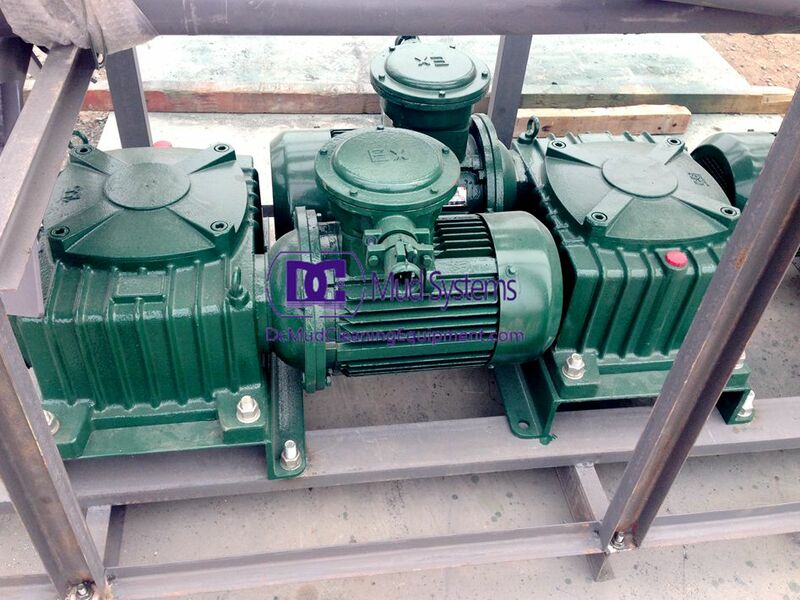 By using single reduction worm gear to achieve drive, it has high transmission efficiency, strong agitating power and high durability. Furthermore, the equipment has fewer moving parts and can be maintained easily with inexpensive cost. The impeller of the product is completely made from casting to ensure excellent mixing performance. With the advantages of compact structure, small volume, low operational noise and slight vibration, our product is the ideal solids control equipment. Drilling mud agitator is a part of mud recycling system. It is designed for mixing mud and avoiding the drilling cuttings deposit on the bottom of mud tank. Its main function is to make the drilling fluid solid particles in suspension. The following table is Troubleshooting Guide of Mud Agitator. All personnel responsible for the installation, operation and maintenance of this equipment should read the following safety precautions to prevent injury to personnel or equipment damage. Turn off power, engage lock out, and tag out before performing any maintenance to the agitator. Do not perform any maintenance or service on the motor before disconnecting the power source. Discharge all capacitors before servicing motor. Electrical repairs should be performed by trained and qualified personnel only. Serious injury could result if safe electrical procedures and instructions are not followed. Inspect the unit regularly, and replace worn or damaged components only with the parts supplied by the original equipment manufacturer. Always keep hands and clothing away from moving parts. 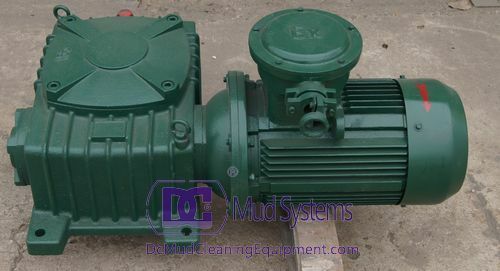 The agitator gearbox has a designated gear ratio to maximize the suspension of solids in solution. This gear ratio greatly increases the torque that is transmitted to the impeller. Never attempt to stop or retrieve any object that has fallen into the agitator tank. Mud agitators should be locked out and tagged out before entering a mud tank for any reason.